I always used to view parents who dressed their kids like them at places like Disneyland with amusement and/or derision. Well, after 3 days of SPL waiting for me to get dressed, I now realize that maybe it’s the kids, not the parents, setting the fashion agenda. It’s a little mortifying to my finely honed sense of style :-), but is more than made up for by how endearing it is to have a hopper want to be like you. And knowing that it’s a phase that won’t last forever makes it more precious. SPL really wanted us to match on the way home today. How can you say no to a five year old on his vacation?? Irresistible. 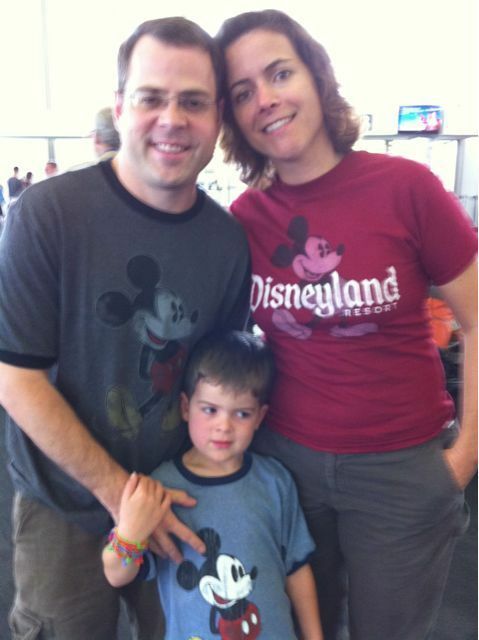 And voilà: the matching family. I will happily ignore a little fashion ignominy for SPL to enjoy things even a little bit more.